Bavette de flanchet is how the French call a flank steak. Here at Beef&Steak you find a selection of the finest bavettes. 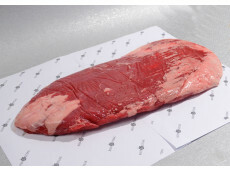 USA grain-fed flank steak (1000 gram). Grain-fed is your choice if you like rich marbling and a creamy bite. If earthy flavours have your preference, try a grasss-fed bavette. On our website your find great cuts of meat and recipes for cooking them. Surprise your guests with some really premium flavours on your barbecue. Order today and have the shipment delevered to your door the next day. If you have any questions, please call us at (0172) 577 147 or if you need help cooking your bavette. We love to help you to make a celbration of any barbecue.